A chronicle of my travel from Suburbia slavery to the "Good Life - a hobby farm." 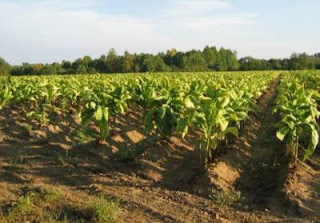 More than any thing else that happened to me in South Georgia as a child, my experiences picking tobacco makes me feel that no matter how citified I become, at heart I’ll always be a country boy. It is one of those bittersweet memories of childhood. At the time I hated it. It was hot and dirty work. But looking back, I see the work did build character (just like the adults always said it would). Children living in the country always look forward to a special event; going to town. Going to town meant shopping, and eating out, and seeing sights. It was like a mini-vacation. One morning as we were hopping in the car for a trip to town, a neighbor’s farm truck rolled into the yard. In the back sat a number of people. I immediately had a bad feeling about the situation, and before I knew it, I was roped into picking tobacco. Yes, we were paid. By my youthful standards I was getting rich, but was it worth it? I wasn’t sure. The tobacco plants were taller than me. I was intimidated. You harvest tobacco leaves by grasping the four or five lowest, most mature, leaves and ripping them down off the stalk. The plant stays intact and the upper leaves continue to mature for another one or two harvests later in the summer. You stuff the handful of harvested leaves under your arm and continue to the next, until you have a large bundle balanced on your hip. This bundle eventually is deposited onto a slow, tractor-drawn cart nearby and then you continue on your row. And so on, and so on, and so on. And then after that, so on again. My brother and I were not very accomplished, and were soon outdistanced by all the other pickers, some of which were girls younger than us, but raised working the fields. An interesting fact about the tobacco plant is that tar exudes from the leaves in tiny deposits. After working a bit, your hands, your arm holding the load of leaves, and that entire side of you body becomes brown and caked with tar. In the morning, the dew on the leaves is steeped with the tar and will make your eyes sting if it gets in them. Eventually, the leaves make their way to the dryers, large trailers, in which the leaves hang and cure in dry blowing air. I came across an interesting book in the library recently, Homesteading: How to Find New Independence on the Land. It’s a great book. Written in 1973, it offers the advice of Gene Logsdon on how to homestead successfully. 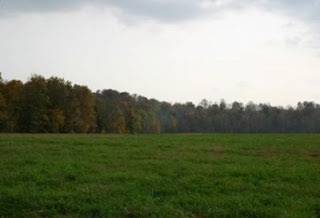 More specifically, he details his general experiences with vegetables, fruit, grains, livestock, locating property and other homestead specific issues. And while yes, the book is over 30 years old, what exactly about growing beans has changed since then? Not a whole lot, I think. I found the book full of common sense, that while dated is still...er, common, or should be. It was pleasant to read about a someone raised to farming from a child, especially when today, many people are so far removed from their food. Here are some other links to his writing. The Unofficial, Totally Unauthorized, but Very Enthusiastic GENE LOGSDON FAN CLUB HOME PAGE! Article entitled National Organic Standards: Kiss of Death? article in The New Farm Classic. When I first started this entry it turned into a diatribe on agribusiness, and I soon realized that topic really needs its own blog. Here instead I just wanted to extol the virtues of heirloom seed. I’ve been reading up again on heirloom seeds; plants that breed true to parentage. These seeds are open-pollinated, which means that unlike hybridized seed (cross pollinated for certain traits that breed true only for the first generation), heirloom fruit produces seed that can be saved and used the next growing season with perhaps even better success. I can grow vegetables from seed passed down generation to generation from strains grown 50, 100, 150 or more years in the past. I often find varieties brought over from other countries. Have you ever bought roses at the florist that look stunning, but have no aroma? Like many plant strains, roses have been hybridized for years to achieve specific qualities; certain colors, fuller flowers, straighter stems. This allows the grower to bring to market a rose perfect in appearance. The price paid for that perfection is a flower with no smell. It’s robbing Peter to pay Paul. Vegetable seed we buy is often produced by the same companies that create seed for large scale farmers, which means hybridized for the grower, not the public. 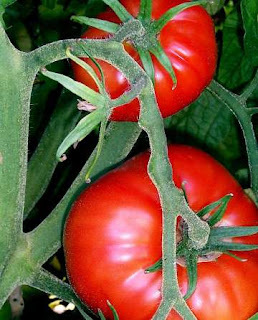 Vegetables are developed with the traits that take them successfully to market: uniform size, thick walls to resist crushing and bruising, etc. You get a pretty product, but what about taste? I mean, we’re supposed to eat it, not put it in a vase and water it. We the public encourage this, by demanding (through our purchase power) 58 different brands of cereal and only three bland varieties of tomatoes: red cherry, red hot house, and roma. Heirloom seeds have a number of attractive qualities besides being able to save seeds. These “forgotten” varieties offer a large variety of flavors, shapes, colors, growing temperaments, disease resistance and hardiness. Earlier this week, non-tropical low pressure system (93L), slopped over Florida. On Monday it reminded me of the 2004 hurricane season. 93L might have been a non-topical low pressure storm, but it brought rain, and then more rain, and then after that a bit of rain. When you build here, you have to account for sideways rain. Rain doesn't just fall down, it often goes sideways. And it's also a common occurrence to have heavy rain and sunshine at the same time. Now, isn't that just wrong? Cool....but wrong. 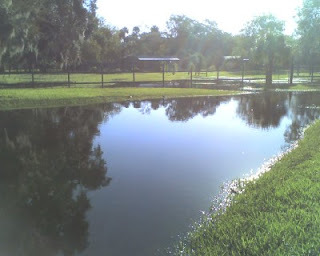 The photo above is of the drainage pond in our backyard and my neighbor's fenced-in farm, taken this morning. Interconnected ditches wind their way behind all of the neighborhood houses and through one or two other drainage ponds before flowing into the pond behind my house. Usually, my pond is dry; today it holds about three feet of water. It’s designed to overflow out the backside, through ditches in the woods into ditches through other neighborhoods until eventually emptying into canals that route the water to waterways. The ditches are as important here as the road system. City employees inspect them periodically to make sure they stay clear and workable. Houses are then built on a foundation raised up a foot or so; just enough to stay above any water. The land is so flat that the water drains off into canals before it gets in your house. In 2004, my house was almost completely encircled by flood waters. Almost everyone loves fish prepared in one way or another: fried, baked, scampi, broiled, stewed. Fish is a healthy and lowfat source of protein. Tilapia are more economical and easier to raise than other fish types. Raising fish in an above ground tank under an overhang eliminates water contamination from rain and groundwater. Tilapia is particularly well suited for raising in a tank. Once ensconced onto ONE ACRE FARM, I fully intend to try my hand at raising fish in an above ground tank made of timbers and a liner or, even better, out of concrete. I’ve seen above ground cisterns made waterproof with a waterproof plaster coating. A squat cistern is just another fish tank. In addition to shading the tank to reduce sun and rainfall, I think I’ll also try a biofilter. Here in Florida, water and bog bog plants grow wild in the ditches. The ditches are full of them. By biofilter, I mean an assortment of mineral layers that provide for the growth of beneficial bacterial and water plants that use and transform fish waste. For instance, with the fish tank, I can make or buy a large tub; layer it with sand, volcanic stone, charcoal, etc; and then in a top layer of sand, plant water plants. Water pulled through this medium should be cleaner. The pump will cycle the water and oxygenate it for the fish. I can also pump the water through a bit of black pipe exposed to our hot sun to warm the tank. Tilapia are tropical fish and like warmer water. Like the beneficial bacterial, the plants also will a bsorb nitrogen from the fish waste. I haven't thought through the feed issue. I'd rather find something self sustaining and organic if possible. Perhaps vermiculture. The end goal for me is about having a very healthy, controlled source of fish for consumption. And although I could snag one here and there for supper as they're gaining weight, I imagine, like with poultry, it might be best to raise them to weight and then harvest them all at one go; clean and fillet them all in one day and freeze. Mother Earth News Magazine article on the different types and benefits of fish farming. Article from Bradshaw on the importance of oxygenating pond water. Journey to Forever article on vermiculture. Practical advice for raising and feeding fish in small areas. More practice advice on raising and feeding fish in small areas. I once saw a Far Side cartoon in which the geeky looking scientist stands before a chalkboard filled with complicated scribbling and equations culminating, at the bottom, with an equal sign and a dollar sign. The punch line of the cartoon is that after years of research Gary the scientist finally proves conclusively that time equals money. (grin) Gary Larson is a trip. Anyone who has ever gardened knows this to be true. When you admire those picture perfect gardens in the glossy magazines, know that they are the product of one of two things; time or money. (and sometimes both…) You can either spend 60 hours a week pulling weeds, creating paths, watering, fertilizing, propagating and planting seedlings, waiting for them to grow, or else you can spend 60K and hire professional gardeners and buy the largest full grown plants you can find. So when I saw these fantastic large terracotta planters and bowls in a local nursery for the low, low price of $200 – $300 a pop, I reigned in my lust and started thinking how to make something similar myself. And the short answer is I still don’t. But…my Internet research did lead me to hypertufa. 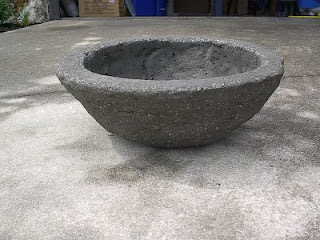 Google hypertufa and you’ll find a boatload of recipes for creating this strong, yet light weight concrete mixture, which can be carved while still uncured. By tinkering with the ingredients and their ratios, you can produce different types of material. The more peat, the more porous and lightweight the product will be. Perlite can create an old, stony looking material. Vermiculite looks smoother. Adding sand increases weight and strength. But no matter which recipe you use, if you unmold your creation after it sets but before it cures (maybe 4 to 8 hours), you can then carve it. With a wire brush, a drill and an old saw you can shape your form. Here is an early bowl I created. I piled the hypertufa over a plastic bowl covered with a plastic grocery bag. I also made my brother a flat bonsai container, my dad a planter and my mother-in-law a square cover to hide the water pipes in front of her house. The homemade wooden forms I made allowed me to create much more professional looking pieces, and the forms were reusable. I look forward to using hypertufa to make a number of concrete items for ONE ACRE FARM. You might also want to check out Walter Jeffries’ concrete work at Sugar Mountain Farm or the interesting article on ferro cement at John's Ottermoon. This past Labor Day, I visited my brother's family at their house in a small rural Georgia town. We had a great time. Nancy and I loved the drive out through the Georgia countryside. We’ve come to enjoy and appreciate Florida in the past years, but the land here is very flat. I first drove into Florida about 17 years ago, down I-95. Of course, one tree lined Interstate looks like another. So, I wasn’t prepared when we broke out of the trees and drove onto the 3.2 mile long Buckman Bridge that passes over the Saint Johns River in south Jacksonville. It was spectacular. I remember my eyes actually feeling a little funny because they weren’t used to looking that far in the distance. How odd. The Florida coast is especially beautiful, and I love the coastal marshes and rivers. But let’s admit it, the rest of the state could benefit from some hills. Of course, this started many conversations in the car about homesteading. We began wondering if a move up to Georgia might be in our future once we sell the house. We’re not restricted to living in Florida. We did rule out an extreme move to somewhere like remote Montana, but we do have other options available, and they all have their pro’s and con’s. We’re already settled in Florida. It has a year round growing season. Georgia, on the other hand is more hilly and green in my opinion. Florida goes tired and dull real quick in the year. Or maybe it just seems that way because fall never arrives; summer just goes on and on and on. Yeah, we get tomatoes in December, but then again the bugs never freeze. See? Pros and cons. I guess in the long run, it doesn’t really make that much difference. I think we could be happy no matter where we land, so long as our family is safe and intact, and I get some chickens and square foot gardens.